Now, we are going to take a trip around the Universe – the Universe that is my home and yours. It is true that a few of you have come from other Universes to be here with us during this monumental time. We are making history together, in terms of our Universe and all others as well. Let me tell you how this came about. We are not the oldest Universe of our kind. There was another nearby Universe which was under development when I came along – that is, when I came into being as the child/creation of the One. I was taught about Creation by witnessing the building of that Universe, which I will refer to as Omarrhan. I saw how intricately the beings, planets and stars are intertwined with one another, and I saw how one tiny mistake on the part of the Creator could explode into chaos. Such a mistake could lead to the necessity of dissolving the entire Creation, dispersing into nothingness the trillions of years of effort and dedication of the Creator and his/her dedicated team. It was a great delight giving birth to the Lightbeings who are my children – those souls who, after billions of years of training would become my assistants in creation, and who would eventually disperse across the galaxies to create loving families of planets and stars, with some variations, but generally along the lines of my original designs. There were as yet no living organisms in bodies on or within the planets. Only the planets and stars themselves were inhabited by my soul children. You are not unfamiliar with some of the elements of creation, of course. Anyone who has chosen a partner and you have decided together to have a child – you know how thrilling it is to be consciously, purposefully involved in the act of creation. This is the way every child should be conceived, with Love and with intention. This is the way we created every living thing in the Universe – with loving intention. As many of you know, there are many races of humanoid beings across your Universe, as there are in other Universes. Those of us who are the Prime Creators are like brothers and sisters, the loving children of One, the first-born who would become the teachers and mentors of those who would come after. Picture in your mind’s eye the interconnected energies which flow between and among the group consciousness which is the family of Creators. As our numbers grew, we welcomed our new brothers and sisters the way a family celebrates the birth of a new baby. No, I did not create every insect, every flower and every animal that moves across the surface of your planet and others, but I did carefully supervise the formulas used, the electro-chemical process which is ignited when two or more souls meld their intention, passion and love, and I have been present at the birth of every soul. You see, the creation of the physical forms is a very different process from the creation of a soul. A soul is an eternal, everlasting Light body with a unique identity and is a living part of All That Is. A body, on the other hand, is an impermanent vessel which is designed to offer the soul a flexible alternative for visiting lower realms – dimensions of a lower vibration than the one in which they were born. Initially, there were just a few of my children who joined me in the process of Creation, for this is not the only activity available for beings in our Universe, as you know. Their brothers and sisters explored far and wide in their Light bodies, even sometimes traveling to neighboring Universes to study and exchange ideas with their cosmic cousins. This fertile exchange led to many new species, many new options for ecosystems which could be created to support the growing numbers of species of flora and fauna we were developing to “house” the souls who had a wide-ranging curiosity and taste for adventure. As I have begun to show you, the creation of souls has been the particular arena in which I had full oversight and command, and as such, full responsibility for the creation and nurturing of every soul within our Universe. It is the fulfillment of my being, my destiny, to do so, with unending Love. The creation of form – bodies – was the realm of all those who wished to learn, experiment and take part in the great expansion of species who were to pave the way for the coming humanoid races, which were among the last forms we created and placed among their fellow inhabitants on the first planets to welcome human-like species. This project – the creation of humankind – was not an ego trip or a reckless adventure, for I have none of those impulses within my own being – they are a temporary effect of your carbon-based body experience in lower dimensions. As you rise up the ladder of vibration, these impulses melt away, but in lower dimensional conditions, these anomalies can cause real difficulties for the inhabitants of the bodies that are subject to such feelings. This brings us to the anomaly which has puzzled so many of you. How is it possible that there can be dark ones – genetically modified Reptilians, greys, Draconians, and all those you have called the dark Annunaki, who have caused havoc in what appears to you to be the entire Universe. I will tell you how this began, and why it has continued as a problem, especially within your Milky Way Galaxy. And so it was decided in the Councils that just a bit of unpleasantness might spur their abilities to appreciate and remain connected to their Creator – to focus their attention, you might say. It was decided that the Masters would develop a few insects which would inflict a slightly painful sting, and a few reptiles whose bite would cause sickness, just enough to prevent the myriad inhabitants of this Paradise from becoming lethargic and indolent. The inhabitants were made aware, in their higher dimensional sojourns, of the change which was to occur, but it did not dampen their wish to return. We were aware of the Omarrhan situation, and were seeing the possibility for similar stagnancy in our own worlds, but were uneasy with the solution, which was being called “bringing in the darkness” in hopes of awakening Light. It made sense from a certain perspective, but seemed risky, since it was our policy to remain as overseers and guides, but not to interfere with the behavior and unfolding of the evolution of those species we had created. At the same time, civilizations were developing on Omarrhan which had very advanced technologies, including spacecraft which could carry the lower dimensional beings great distances (higher dimensional beings have no need for spacecraft, although it is a great convenience when they wish to carry equipment or materials between planets or galaxies). It was only a matter of time, so to speak, before the experiment went awry, and a number of the lower dimensional species became fascinated with the idea of experiencing the curiosity of seeing the effect of darkness on themselves and others. It was only a small step then, to learning how to avoid their Creators, turn their backs on One, and set out on their own to experiment on others. This was the first “Fall” from Grace, and it spread rapidly across the Universe, to the many planets where indolence, a problem in the lower dimensions, had made the embodied beings of high intelligence restless and ripe for a new kind of excitement. With many species of intelligent beings taking part in the melee, and alliances building to create a powerful military force, it was decided that to allow “the experiment” to continue would be too dangerous for the entire Multiverse, and that the only possible resolution would be to offer amnesty to those who were willing to return to the Light, or suffer dissolution. Of course, I could have taken matters into my own hands and simply destroyed them, but in counsel with my Masters and with One, it was decided that we would take the path of Light and Love, always. We were a strong and resilient group of souls, some of whom had already thoroughly studied the problem of Omarrhan as part of their own development. It was decided that we would attempt to rehabilitate the dark ones from Omarrhan, while protecting our own territories with a “defensive response only” policy. It was then that the Galactic Federation of Light was formed, and it grew quickly into an able military alliance under the guidance of the one we now call Ashtar, with the mandate to protect and defend all lower dimensional beings and planets, without at any time declaring war on the invaders. It was made clear to the dark ones that we could “disappear” them at any time, but that we would work with them to help them find settlements where they would be allowed to live peacefully, but on our terms which did not allow for military intervention toward any planet or group of beings. With the agreement of Mother and Father God, they were permitted to establish a “refugee” camp on Mars, and later they created outposts on the far side of Earth’s moon. The rest is history, as they say. You see, the triumph of Light over Darkness never could have been resolved by war, for war is darkness, nor could it have been “defeated.” Those who invaded our beloved Home were simply mistaken in their beliefs, and they convinced many of you that they were right, did they not? Earth had become their playground for a time, but you and I never intended to succumb to their seductions. You may have forgotten for a brief time that fear is not a viable part of our lives in the Light, and you weakened under the weight of the totalitarian mind control, to a point where you became focused on their destructive tools, implants, psychological manipulations and illnesses, as if they actually controlled you. NOTE BY NANCY: This article does an excellent job of describing how the FEDERAL RESERVE controls every facet of our lives. Americans are taught to blame the President, Congress, the Governor … any political entity. In Truth, the Federal Reserve controls the entire political system! The public view of our political system is very corrupt, from federal on down to the local levels. What the public rarely sees are the truly for the people’s good actions that some politicians manage to accomplish behind the scenes. Ambassador Lee Wanta’s mission as assigned by President Reagan was to bring an end to the Cold War by destabilizing the Soviet Union’s monetary system, while at the same time offering them a win/win solution that was too good to refuse, which they actually did accept. An explanation of how the Federal Reserve controls the entire U.S. Government. The story: Lee Wanta and President Reagan had developed a very dynamic, ingenious plan to Revitalize and Industrialize America and also to Nationalize the Federal Reserve System, thereby removing all existing deficits and replacing a FIAT debt-based monetary production and distribution system with a currency backed by Gold, Silver, precious metals and valuable commodities. Lon Gibby: I have been working on a new documentary film entitled “Eagle One to Wanta”. It is the compelling story about President Reagan, and how he brought about the fall of the Soviet Union and ended the Cold War without firing a shot. Foreword by Preston James, Ph.D. Recently a quite detailed snapshot into how the USG (U.S. Government) functions in secret has emerged incidental to the efforts of **Ambassador Lee Wanta to gain access to Trillions of Dollars which have been confirmed to be his personal property. This Xray view into the inner workings of the Secret Shadow Government occurred in response to the efforts of Ambassador Lee Wanta to collect the Trillions of US Dollars that were awarded to him by a Federal Court. This vast amount of money is the proceeds of what Lee Wanta earned honestly engaging in major currency speculation as President Ronald Reagan’s Secret Agent under the Totten Doctrine. Ambassador Wanta’s mission as assigned by President Reagan was to bring an end to the Cold War by destabilizing the Soviet Union’s monetary system, while at the same time offering them a win/win solution that was too good to refuse, which they actually did accept. History will show that the the Soviet leaders accepted Ambassador Wanta’s proposal and signed an historic General Agreement of Cooperation between the newly formed Russian Federation and the United States of America which is still binding even today. This was a major historic breakthrough that was kept secret from the public at large until just recently. This General Agreement of Cooperation is historically notable because it ended the Cold War with an economic win/win situation and resulted in the Wall (“Iron Curtain”) coming down which had separated East and west Berlin, East and West Germany, and other Soviet Satellite countries from the free nations of the West. What has never been public information until lately is that these efforts of Ambassador Wanta have been credited for the end of the Cold War while preventing what seemed to be an almost imminent nuclear WW3 between Soviet Russia and the United States of America. This was a major historical achievement for the United States that Lee Wanta attained and if a Criminal Cabal had not blocked efforts by Lee Wanta to access money which was rightfully his, America would likely have never entered the numerous dysfunctional Mid East Wars and experienced such serious economic declines, especially the recession of 2008 and the lack of real recovery afterwards. The remaining part of the story of what Lee Wanta accomplished attaining the General Agreement of Cooperation with the Soviet Union and it successor the Russian Federation which was so secret that it was kept from the public until recently. That major secret is that Ambassador Wanta made a staggeringly large, almost unimaginable profit from his currency speculation which actually totaled 27+ Trillion US dollars. This amazing accomplishment has resulted in Lee Wanta being given the nickname “The 27 Trillion Dollar Man” by other insiders that knew what he had accomplished. The rest of the story which needs to be told to all Americans is that Lee Wanta and President Reagan had developed a very dynamic, ingenious plan to Revitalize and Industrialize America and also to Nationalize the Federal Reserve System, thereby removing all existing deficits and replacing a FIAT debt-based monetary production and distribution system with a currency backed by Gold, Silver, precious metals and valuable commodities. Ambassador Wanta has reported in several recent interviews that he has planned all along to use the Trillions he earned and which has actually now been adjudicated as his own personal money by a Federal Court, to build a large state of the art 200 MPH+ coast to coast High Speed Maglev Railroad, and to pay off the so-called National Debt. The following story is written by Ambassador Wanta’s Television, Film and Communications Consultant producer Lon Gibby, who was a witness to this recent snapshot or x-Ray view into how the US Government is controlled by insiders and not by “We the People”, nor those who are supposed to represent us. Lon Gibby is presently producing a very dynamic movie that tells the story on the 27-Million Dollar man, Lee Wanta. PuppetGate … by Lon Gibby, CEO Gibby Media Group, Inc. Here is the explanation of PuppetGate, how I came upon it, and why I named it this. I have been working on a new documentary film entitled “Eagle One to Wanta”. It is the compelling story about President Reagan, and how he brought about the fall of the Soviet Union and ended the Cold War without firing a shot. President Reagan and his secret agent Ambassador Lee Emil Wanta masterminded a creative way to financially take down the economy of the Soviet Union, and put together and negotiated a General Agreement of Cooperation with Secretary General Mikhail Gorbachev. As a result, the Russian Federation was born, and future generations throughout the entire world have enjoyed more safety from a nuclear holocaust because of this effort. Working directly under President Reagan as a private citizen, there is a man named Ambassador Lee Wanta. Lee was mandated by President Reagan under the Totten Doctrine as a secret agent to be in charge of this effort. In this process, Lee Wanta did amass trillions of dollars that were designated to go back to the American people by President Reagan. In his effort to carry out his mandate, Lee Wanta was imprisoned and the monetary funds that were his to distribute as planned were stolen or converted illegally by an organization known as the Federal Reserve System and used by them to this day. Later in 2006, a US District Court Judge mandated and ordered that these converted funds be returned back to Lee with interest accruals. It’s hard to understand why, after eight years since this order was given by a US Judge, these funds are still retained. When Lee Wanta receives his funds back it will be in the amount of 32.8 Trillion Dollars. He promised under an oath to President Reagan, after he paid his repatriation taxes on this money that he earned as Director General in his Austrian-based company, to eliminate overnight our national debt ( Approximately 18 Trillion), and our 1.8 Trillion International trade deficit at once. Lee Wanta also pledged to pay certain sovereign nations what they were promised in the Reagan-Mitterrand protocols. This includes the French, Chinese, English and Russian Governments, where billions were promised. With the remaining funds left over, he plans to and develop and create new innovative businesses that could employ over 2 million people in the USA alone. The Hand: Who and what is the Federal Reserve System, sometimes called the FED? It’s not a bank, like so many of our citizens are led to believe. The word FED means nothing when applied to this organization. Here is what I learned as a documentarian, filmmaker and simple small business owner. I learned that the Federal Reserve System is not a Bank, and it is not a part of our Government. It is not Federal in any way, yet it somehow has control over National and the World’s financial resources, and impacts every American and person on the planet. Just because it uses the name Federal does not make it Federal. Federal Express was a brilliant marketing scheme which was successfully used to develop a brand. Many people believed, and still do, that Federal Express or FedEx was and is a Federal organization. Its not! At least FedEx is a real business, whereas the Federal Reserve System is not a legitimate business or Bank. The Federal Reserve System is a powerful private organization operating well outside the United States’ Constitution. It has its roots way back to 1913 when Congress lawlessly approved the Federal Reserve Act that allowed a private group of families, gangs and wealthy people the right to control the banking industry exclusively. With a little research anyone can find out that some of the people who run the Federal Reserve System are not even Americans and represent foreign interests. Besides setting interest rates and controlling all the banks’ money, the private club called the Federal Reserve System literally controls almost all aspects of our Government on Federal State and County levels, and seeks to manipulate and control the world financial markets as well. 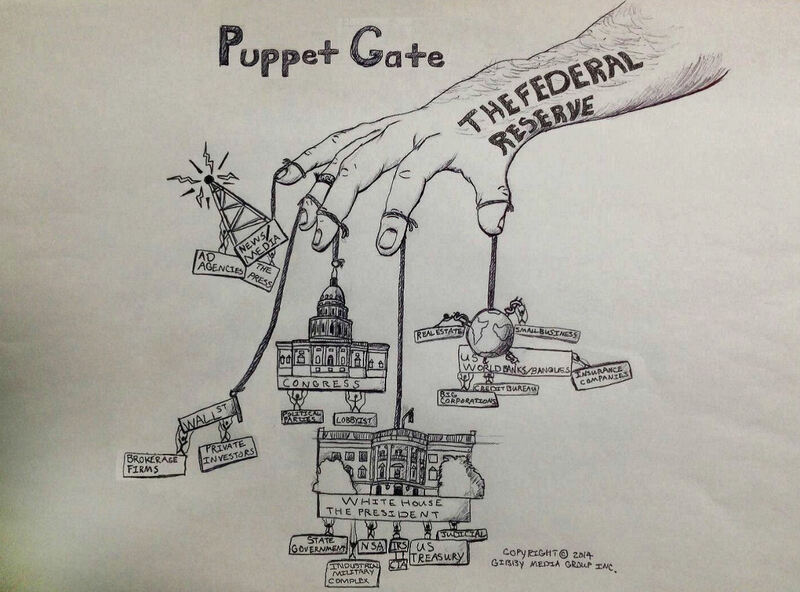 The PuppetGate illustration will help you visualize how they control us with their five fingers. Just like a Puppet Master controls a Marionette, or a Ventriloquist can speak for others, they have learned how to control and manipulate each key area of our Government and American society. I have learned that the Federal Reserve System operates with a team of what they call themselves — Puppet Master. These are people who are trained and skilled at payola, manipulation, bribery, blackmail and extortion. This secret combination is most powerful, and they have support from all political parties and from well-known and respected Politicians from all parties, both past and present. No one likes to talk about them because they wield such power that even Presidents obey their commands. We have all heard and understand the saying. “Those that has the gold rules”. They have the gold and they do rule. As history will prove, they have ruled in a selfish and brutal way, with little regard for our Citizens and the Constitution of our land. The problem is, in the case of Lee Wanta, they don’t own his gold and funds, but they have illegally taken and used his resources to sell trillions of dollars in worthless Federal Trade Notes and derivatives, and continue their illegal campaign of puppetry on the Citizens of the United States. Remember that the Lee Wanta money was never theirs to use in the first place. The Wanta funds were mandated by President Reagan to go towards our wiping out our national debt, to improve our lives and were to be used as outlined above. Finally, understand that the massive Reserve bubble is about to burst because they do not have the resources or reserve to back up what some are calling the mother of all Ponzi schemes. The only hope they have is to create a destabilized world by starting more wars by meddling in the affairs of other countries. Since 1913, War has been an essential part of the growth of the Federal Reserve System. Who finances and makes lots of money on wars? They do. Who suffers from the effects of war? The people. Today I believe we are seeing a desperate effort by those same puppet masters to destabilize the world and create more war. That is the pattern they have followed since 1913. It’s what history teaches us. I hope and pray we can learn from history and make the necessary changes on behalf of our people and all the future generations yet unborn. We should eliminate this unconstitutional organization that controls our lives and operates to control people and feed its own vain ambitions. PuppetGate represents the analogy and parable of how I visualize the way our Government is currently operating. Remember “they that controls the gold rules” and that is the Federal Reserve System, Supreme Puppet Master, the big hand. The Thumb: The Thumb represents the Banks and the strings attached to the entire banking industry. Under the Banking thumb is big corporations and small businesses who get very little support (stimulus and loans), credit bureaus and Real Estate, which all require the blessings of banks. Way down the string below another puppet master is the typical hard-working American and small businesses owners. As we all know, the thumb and the index finger are very strong and powerful when they operate synchronized together. The Federal Reserve hand or the supreme puppet master can and does manipulate in many ways all the banking industry, including interest rates, inflation, etc. The Index finger: This represents the Presidency White House. Notice the Presidency has a longer string than other fingers and has more strings to control under it. The NSA and CIA all take orders from the President and his Cabinet. Strings to funding State Governments can be pulled at any time if they are not following in line. Remember, there are strings attached at every level. The Industrial Military Complex is under the index finger as well, and must strive to maintain its funding levels, and needs instability in the world to feed it. The Treasury also answers to the President. It would be nice to know how much real gold we really have to back up our dollar? No one seems to know? Yes the index finger or Presidency has strings attached to the judicial arm of the Government. Remember who appoints our Supreme Court Justices. The Judicial side of our Government, as we all know now, is not exempt from bribery, cronyism, and blackmail, just like all the other parts of our Government under the hand of the Federal Reserve System. The middle finger: The middle finger controls the Congress, and as you can see the string is very short. There is not much room to move. Sometimes congress is like a yo-yo going up and down on the string. The more Congress is divided and contentious, the better for the Supreme Puppet Master. All political parties are manipulated by the fact that elections and pork barrel bills are all funded ultimately by the supreme puppet master Federal Reserve System, regardless of the source. The hand influences and heavily controls who will stay in Congress for life, and who must leave after short terms. Congress has lobbyist and political parties underneath them on a string. Unfortunately, that’s about all it has going for it, besides the voters, who are also sometimes used as puppets to win elections. Most people agree today that Elections are won on the amount of money spent and creative marketing and branding ploys that influence voters. Money for this and how it is spent is controlled by the hand, Supreme puppet master, Federal Reserve. In Congress we see examples almost every day of how deeply divided they are. I feel they should be assigned seats like in high school to sit with each other and not in a big divided group. On TV it emphasis just how divided is our country when you see a whole block stand up and one sitting down. They do not seem to be able to agree on much of anything and waste precious resources a lot of times over pride and stubbornness. Many elected officials do not show up (unless it is the state of the Union speech) to listen to the arguments and discussions, and often simply vote as they are told by the Puppet master above them. Having a Congress that is dysfunctional means that more Constitutional power is being relinquished over to the index finger President. Congress is commissioned to pass laws to help our people — and thank goodness — occasionally they do succeed, despite the polarization. But the fact is, most often those who have the most money behind them will win. Congress is often times hypocritical, routinely breaking their own laws that they have passed. This sets a bad example for the public and again, gives the hand more control over us. The Ring finger: The ring finger with its gold ring band represents the finger that controls Wall Street. Lately, Wall street has been approaching record levels, giving a false appearance that the economy is growing. It’s like a movie set that has a great facade of buildings on the street . When you walk behind the set, you see it is propped up. The Wall Street facade and bubble will eventually burst, as it always does. Who will lose the most money when this occurs? Who is making money now off of Wall Street as the bubble grows? Certainly not many middle or lower class Fellow Americans are making much investment money, since their spendable income is at an all time low. It appears an elite group is benefiting from Wall Street the way it is structured and controlled by the hand. That will be the subject of another article later. The smallest finger: The small finger on the hand , the pinky , controls the news media and press. The Free Press is not free with a string attached. Today’s media strings that are attached would be massive advertising contracts from both parties and plenty of money on the table to make sure some of the real news is suppressed. The conditions that allow a Free Press to function are not currently working as they should. There are some news outlets trying hard to report the truth but some of them are easily silenced with money, payola, bribes and threats that are real. The public, instead of having a watchdog, has a hamster to guard against the corruption and selfish interests of the hand. The hand basically controls the Free Press in today’s world. I believe even social media is manipulated by experts in technology who have been paid well for their work, disruption, spam and hacking. Election time is like winning the lottery for the Press and News Media. The entertainment industry loves it too, and benefits as well. The more contention and polarization between candidates, the better. This distracts from the mission of the hand. No campaign spending limits makes it a win–win for all elite media regardless of who wins and how it impacts our country. There are a few bold organizations trying hard to report the truth, but they all dangle from a very fine thread if they do not agree to be manipulated by the hand. Evidence: Evidence of PuppetGate can be found everywhere in our country and overseas. I believe this system of control is so commonplace that it is at all levels of government and big business. It has become the normal way to conduct business. Just one example is a recent accidental message left on a phone call to Lee Wanta. A former State Governor and former State Representative discussed how they expected to receive personal funds in upwards of 10 Billion dollars when Lee receives his funds back. (1) The conversation goes on to plan a strategy to threaten and intimidate Ambassador Lee Wanta if he does not give in. This conversation was published on the Veterans Today News site on http://www.youtube.com, and the attachment can be listened to. The actual conversation is only about six minutes long, but says a lot about PuppetGate in general as to how things really work inside the Beltway. Good News: The good news is that for a sore or boil to heal, sometimes the best thing that can happen is that it is drained or lanced. In order for a healing to take place and for us to get back to the pre-1913 Constitution, we need to remove the Federal Reserve System now. We need to make sure Lee Wanta has his funds returned, as ordered by a US District Court Judge. I believe he will do what’s right with these funds as outlined, and he will follow the leadership and direction given him by President Reagan. We have a wonderful people in America who care about our future and will vote properly if given a good choice. Let’s encourage more qualified people from all colors and walks of life to run for office and to step up to lead. By the way, they all do not have to be attorneys at law. When anyone runs for office, they need to be oriented properly to what is the right way to function. We need to work hard to elect good strong Americans to office and expect them to maintain a higher bar than what we see now. If you look closely at the PuppetGate diagram, you will see that our military is not dangling below the fingers or the Hand. Yes, there is a Military Industrial Complex under the President. That is the big money and big business part of the military system. But our operational military is well-equipped and is made up of mostly honorable men and women sworn to protect us and our Constitution from our enemies, both domestic and foreign. I believe the leadership of the Military is basically strong and capable of helping to resolve any issues we now face, if required. Fortunately, we do have a number of outstanding State Governments that are setting great examples of fiscal responsibility, which the real Federal Government should learn and model themselves after, forevermore. Everyone knows what a gate is since the 1970’s. By adding Puppet to the word gate to get PuppetGate, we get a simple visual explanation of how things operate today in America. This is not Howdy Doody time with Clarabell the Clown or the Wizard of Oz. There are Strings attached, Kickbacks, Bribery, Blackmail, Greenmail, Extortion, Payola and real criminal activity. It’s now more commonplace in politics than at any other time in our history. It’s at the top, all the way down to the bottom. Let’s change it back to so that the Hand is “ by the people and for the people”, and let’s work and get back to the precious freedoms and liberty our constitution provides for. I’m just a small business owner, middle class family man, documentary TV and film producer who is willing to share his opinion and thoughts. *Lon Gibby, CEO of Gibby Media Group, Inc.
**Lee Wanta was a former Presidential Secret Agent under the Totten Doctrine [92 U.S. 105, 107 (1875), National Security Decision – Directive Number 166, dated March 27, 1985, inter alia] under U.S. President Ronald W. Reagan, whom some experts consider to be our last legally and duly elected President. Ambassador Wanta served – under Presidential Mandate – as a close personal consultant to President Reagan and was credited with having a major role engineering an end to the Soviet Union Cold War and the “tearing down of the Iron Curtain”.